One thing people think when considering going cruelty-free is that they will find themselves shopping at health and organic shops. Every Friday I will try to show you how easy it is to find cruelty-free products, like laundry detergent and hand lotion, at your favorite stores. Today, we're going to Target. 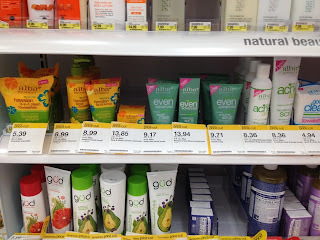 As I walked into my Target Supercenter, I was excited to see several cruelty-free products in the flier for this week! My first stop was the cleaning products section. I do actually need a few things, so this was the perfect time. Jackpot! 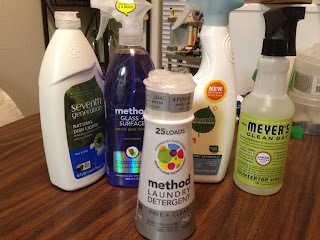 Two cruelty-free laundry detergents right next to each other: Method and Seventh Generation. I decided to go with Method, since it was a smaller bottle, and a bit cheaper. Look how tiny it is! This $6 bottle is 25 loads of laundry! I usually buy All or Purex, which is a couple of dollars cheaper. Next I needed some cleaners. Method, Mrs. Meyer's and Seventh Generation cleaners were all next to each other on that part of the aisle. I chose the Method glass cleaner. The Mrs. Meyer's surface cleaner. And the Seventh Generation bathroom cleaner. And in the next aisle, I grabbed a bottle of the Seventh Generation dish soap. All these products are cruelty-free. These were easy to find. 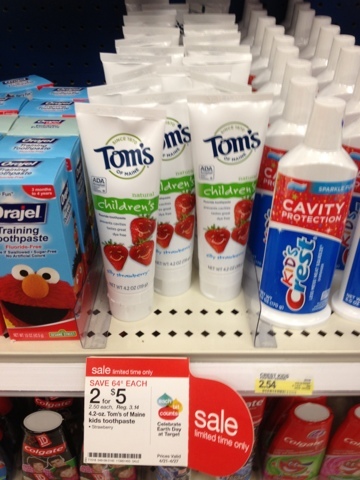 But the problem with Target is sometimes things are not where they should be. For instance, Mrs. Meyer's and Method hand soaps were with the household cleaners. Shampoos were in the beauty products section. This is Giovanni, a cruelty-free shampoo and conditioner. And I found it in the beauty products section. Right next to the Burt's Bees section, which also has shampoos and conditioners. Did you know that? They also have makeup and other products, on top of that familiar lip balm we all know. I also found Alba Botanicals, Gud, by Burt's Bees, and Dr. Bronner's Magic Soaps. I also found E.L.F. Cosmetics. These are not on the Leaping Bunny list, but they are on the PETA lists. Finally, I found one last product in Toothpaste section. 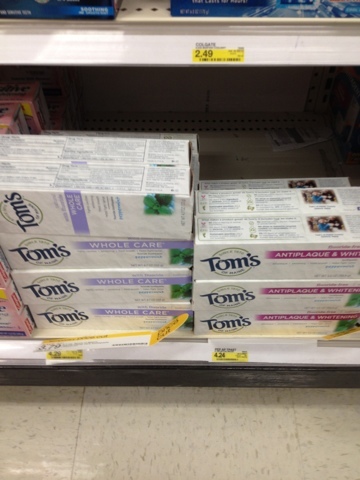 Tom's of Maine was next to the Sensodyne! And they even have a children's version. So it is possible to find lots of great cruelty-free products in Target. You just have to look a little harder. Here are the products I bought. I'll be reviewing these over the next few weeks. Next week, we'll be checking out Walmart! It's review day in our 30-day Cruelty-Free Challenge! Today, Lulu got a bath. She hates baths. But it can't always be fun and games. Lately, we've been using two products for Lulu's baths. Both happen to be cruelty-free. I like to use the Tea Tree Oil soap on Lulu. It works really well in getting rid of fleas. I didn't think Lulu had any, but just in case, I figured I'd give it a shot. I let her stay in the tub after soaping for a few minutes. No fleas when I rinsed her off this time, but believe me, the fleas just fall off using Dr. Bronner's. Dr. Bronner's comes in many scents. I have a friend who uses different scents on her dogs for different things -- lavender for calming, eucalyptus for itchiness. 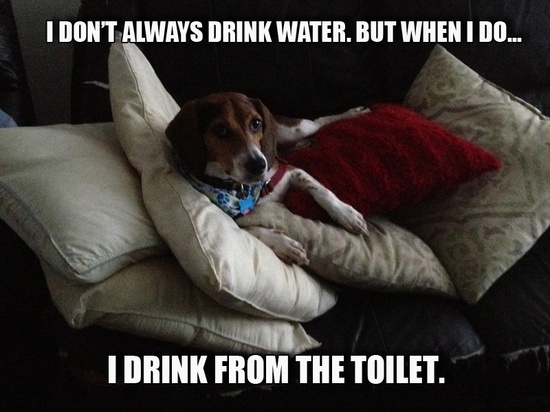 And Dr. Bronner's is not just for dogs. I've used that same bottle as a shampoo for my own hair. You can wash yourself with it. Dr. Bronner's says a single bottle has 18 different uses. My only big problem with the Dr. Bronner's is afterwards. The fur can feel a bit... resiny afterwards. That's when I break out the Organic Oscar. I got this in my Wag-in-the-Box back in January, and it's a fantastic product. I apply it on Lulu the same way I apply the Dr. Bronner's -- coat evenly, let it sit for a bit, rinse off. It leaves Lulu's fur feeling so soft. 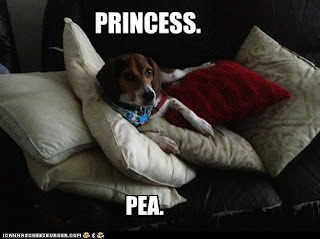 Now if only she would stop drying herself on the furniture. You can find Dr. Bronner's at Target stores, Whole Foods Markets, Vitamin Shoppes, and other health food stores. They have a store locator on its website. Organic Oscar is less easy to find. It is, of course, available on Amazon.com, and it's also available on the Organic Oscar website. Right now it's selling for $9.99 a bottle. And, both products are on the Leaping Bunny cruelty-free shopping list! I have a discount code for Wag-in-the-Box, where every month, great products like Organic Oscar will be sent to you. 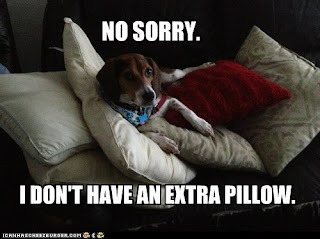 Helping beagles this Earth Day: A cruelty-free challenge! Another way is to buy products that are safe for the environment -- and for animals. Beagle Freedom Project says 70,000 beagles are currently used for research experiments, and millions of animals around the world are in cages. So in the next month, I'll be looking at cruelty-free products -- products made by companies that don't test on animals. Everything from hand lotion to laundry detergent. I'll be trying to add those in my home. It's not always easy -- but we will review those products and tell you which ones are good and useful. How can you find cruelty-free products for you home? There's a website called Leaping Bunny. 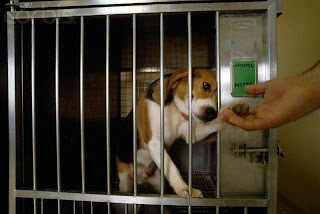 It was founded by 1996 by a group of animal protection leagues to end animal testing. They have a list of cruelty-free products, and even a shopping guide. We'll use this list to find those products. So I hope you'll join me for this challenge. I'll be posting about a new product every Wednesday! What cruelty-free products do you use? What cruelty-free products do you suggest I review? A couple weeks ago I told everyone I was determined to turn Lulu into the next Grumpy Cat. Thanks to Carma Poodale Allen for this. 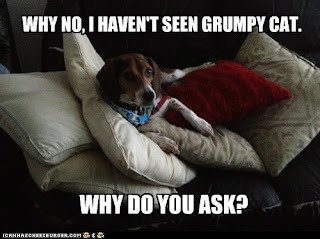 This is from Ann from Pawsitively Pets. And we got two from a reader called "ONoYouDont:"
Want to make you own? Head to cheezburger.com and use the Builder. 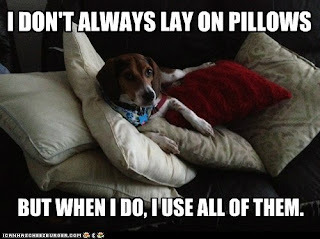 The photo can be found under my blog name, lifewithbeagle! In January I did a sort of diary of our experiment with the Thundershirt to help calm Lulu so I can refocus her when she starts barking. Since then, I have been trying out another compression shirt to see if there's a difference. And these straps in the back, which go around the legs. Did you know that dogs carry stress in their back legs? These straps help ease that tension. But they do make putting the Anxiety Wrap very cumbersome to put on. The material is light-weight and breathes well, compared to the original Thundershirt. Getting Lulu to refocus using the Anxiety Wrap has not improved much compared to the Thundershirt. I still need to calm her down when she barks at other dogs. HOWEVER, Lulu also doesn't bark at trucks or golf carts when we're walking with the Anxiety Wrap on. That's a big difference. If your dog has anxiety issues, particular with loud noises like thunderstorms, fireworks, etc., it's worth trying a Thundershirt or the Anxiety Wrap. But understand it may not work with your dog. Mom's dog Cappy got a Thundershirt a couple of weeks ago. Mom says she put it on when Cappy started barking at people outside the house. She says Cappy immediately stopped barking and laid down. What's also great about this is when Cappy stopped barking, my mom's other two dogs who bark when Cappy barks stopped as well. That's a relief to my parents who can't stand hearing three small dogs barking at once! By comparison, Pepper of Pepper's Paws prefers the Anxiety Wrap over the Thundershirt. Look for her review soon. A lot of it depends on the dog -- their level of anxiety, how they handle wearing the shirt or wrap. It also helps to make sure it's properly fitted. If you can get it done at a store, that would be good. If they aren't tight enough it won't work as well. The best thing to do is get a Thundershirt or Anxiety Wrap at a place with a great refund policy. That way if it doesn't work you can return it. The Thundershirt can be found in many pet stores. Anxiety Wrap is available in Amazon.com and on the Anxiety Wrap website. I WANT TO HEAR YOUR STORIES! Have you ever tried a compression shirt for your dog? Which one? Did it work? I'd love to hear! DISCLAIMER: I received the Thundershirt for Cappy and Lulu's Anxiety Wrap for free from their respective companies. "There's a squirrel by you, Mom! Let me get it!" Animal services agencies across the country have been hurting since the recession, both with the explosion of pets from people who can no longer care for their pets, and funds being cut. A Florida lawmaker wants to let voters decide if more money should go to animal service agencies. But a powerful lobbyist, and veterinarians, are fighting the bill. Miami-Dade County lawmakers are pushing HB 1127, the Pet Trust Bill. The county's voters supported the idea last year. FL Rep. Frank Artiles, R-Miami, thinks other counties should have the right to do it. The bill creates a special taxing district, and uses the tax money for all sorts of pet services, and specifically spaying and neutering pets. About 80 percent of the funds have to go to Spay and Neuter Programs. Supporters say the spaying and neutering programs, in the long run, is cheaper than euthanasia, and is better at controlling the pet population. But this bill didn't even get voted on in committee Thursday, because opposition was so strong. Marion Hammer, president of the Unified Sportsmen of Florida, and National Rifle Association lobbyist. According to the Miami Herald, Hammer told the committee that Florida would become a dumping ground for unwanted pets from other states. 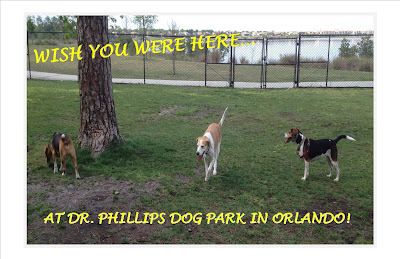 “If this bill passes, Florida could become the pet welfare state of the nation,” she said. Veterinarians in Florida are also against this bill. The Florida Association of Kennel Clubs also opposes the bill. They don't like that property can be taxed to find these programs. So it's not known what will happen to the bill in the Florida House. The companion bill in the Senate already passed its first committee. FL Sen. Gwen Margolis, D-Miami, is sponsoring the Senate's version. If you want this bill passed in Florida (or you want it to fail), contact the members of the House committee on Local and Federal Affairs to try and get the bill back on the agenda for a vote. It has to pass the committees before it can get anywhere. Also, if you live in Florida, you can find your state representative HERE. You can also find your state senator HERE. 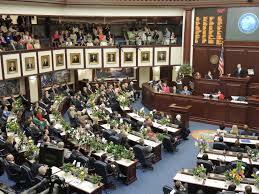 Later this week we'll talk about other animal-related bills up for a vote in Florida's 60-Day Legislative Session. Doggie Art Festival, Woof Gang Bakery -- great events this weekend! April is a big month for events in the Orlando-area! All weekend: Fiesta in the Park returns to Orlando for another year. This family friendly and pet-friendly event at Downtown Orlando's Lake Eola is a huge craft show with hundreds of vendors and lots of food. Fiesta in the Park runs Saturday from 10 a.m. to 5 p.m., and Sunday from noon to 5 p.m.
Find parking information and more on the Fiesta in the Park's website. Saturday: Woof Gang Bakery in Orlando on Conroy Rd. and Dr. Phillips Boulevard is hosting a big remodeling celebration! From Noon until 5 p.m., Woof Gang will have all kinds of promotions, and complimentary nail trimmings. Woof Gang Bakery is an Orlando-based company with pet boutique franchises in several states. I did an interview with the founder of Woof Gang Bakery, and I'll be bringing that to you this month! On Sunday, The Doggie Door is hosting The Doggie Art Festival! Stroll down Park Avenue in Winter Park from 10 a.m. to 4 p.m. and check out artists, pet vendors and adoption groups. I'll be there with Lulu, and with Beth and Gizmo from Terrier Torrent. If you see us, stop by and say hi! Looking for more happenings this month? Check out my area events calendar. Know of an event I've missed? Drop me an email! czizo@cfl.rr.com ! What are you up to this weekend? I want to hear! Photo courtesy of Puppy Cake. 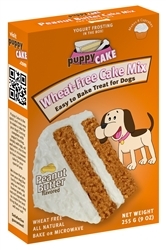 The nice people at Puppy Cake sent me a box of their peanut butter cake mix for us to review. It came in the mail yesterday, and I THOUGHT I had kept it out of Lulu's reach. But this is what I found when I got back from the doctor today. Puppy Cake is like a Duncan-Hines style cake for dogs. They come in a variety of flavors -- banana, carob (a chocolate alternative that's safe for dogs), peanut butter and red velvet (no food coloring, they use beet powder for color). This happened after I had picked up the bag to take to the garbage in the kitchen. ... right out of the bag. It also comes with a packet of unflavored yogurt powder. A few teaspoons of water turns this into a frosting. Lulu especially liked this part. There was nothing left! Lulu seemed to like it, or at least the mix. If you have a pet with a really good nose... keep it high. REALLY HIGH. This is one penitent puppy. Puppy Cake has a store locator on their website. I think it's safe to say Puppy Cake could get a new slogan from this review: Cake so good dogs won't wait for you to bake it! DISCLAIMER: This was not meant to happen. I'm making the best of a bad situation. Do not try this with your dog at home. ANOTHER DISCLAIMER: As I state in the review, Puppy Cake sent me a free box of cake mix to try out. I don't think this is what they intended.